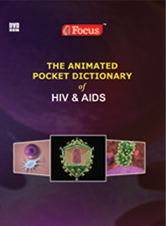 The FOCUS Animated Pocket Dictionary of HIV & AIDS, the first ever animated dictionary in the subject, fills that void quite effectively. A must-have resource for physicians and students who would greatly benefit from this module, it covers 100 HIV & AIDS related terms and definitions. All the definitions have been described with breathtaking, state of the art 3D animations and presented in this DVD-R format that allows easy search like a print dictionary, making study more interesting.